On Monday, Lydia and I met at work at 6am, to load up our cheese, chutneys, display materials and all the other paraphernalia we have been slowly accumulating over the last month. Stuart stayed in Hawes, working his socks off, with Mark, making cheese and holding the fort whilst we were away. Bleary eyed, it took us twenty minutes to load up, which wasn’t bad, and we set off to see Mr Moyden: Martin and Beth at Mr Moyden’s cheeses, near Shrewsbury. It was interesting to watch the scenery change to richer, more fertile arable land with fields of wheat and barley and horses, as opposed to rugged, craggy limestone with hill sheep. It was also sunny, a relatively rare event at Hawes. the Nantwich showground. We were more than a little apprehensive as we have never done a show before and to do a big one like this seemed perhaps a little ambitious. I think we were incredibly lucky with our timing: there was not much of a queue to drive up to the show tent, so we parked up as close as we could and found Chris at Bradburys who kindly showed us our stand. Not only that, we managed to borrow a trolley so that we only had to make one trip with all of our cheeses, chutneys etc. This made life so much easier, as we realised at the end of the show when we had to cart the remains of our cheese, chutneys and other paraphernalia, crate by crate through the show tent, across the road and through a field to the car. More of that horror story later. We had a corner pitch in the English and Continental cheeses section, although I hasten to add that we took all of the cheeses that we make ourselves. We were on the corner, with Fowler’s cheese to the left of us and the Cornish Cheese company to our right and next to them was our friend Sean Wilson and his Saddleworth cheese. Having found our 2m stand which already had a paper cloth over it, we unearthed our black velvet cloth and started to dress it. 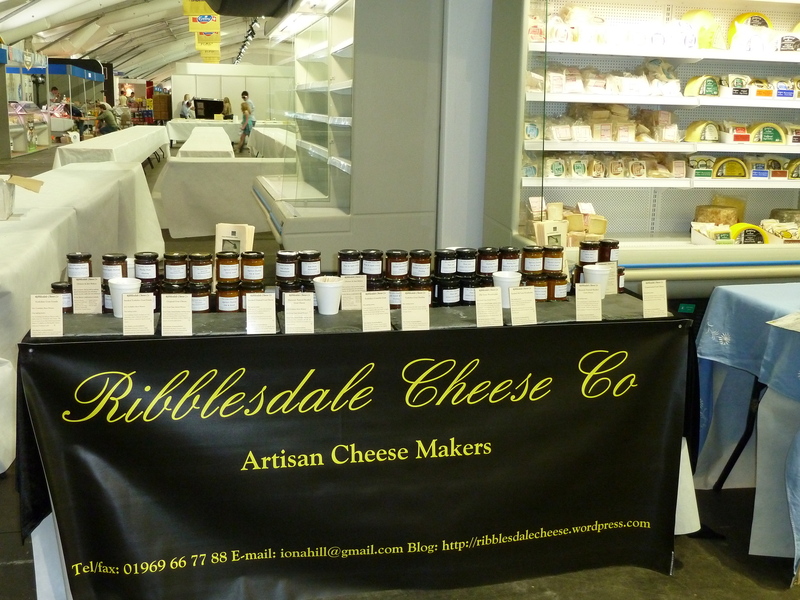 We had slate for our cheese samples and behind that we displayed a range of our chutneys. We had also prepared tasting notes for each of our cheeses together with a recommended chutney in little display stands. We unloaded the crates and bit by bit, Lydia artfully arranged the table – she is far better at these things than I am. The hardest job was working out how to fix our banner to the stand! But that was about the only thing we were unprepared for. Adrian from Fowlers came to the rescue (after watching us and stifling laughter for 15 minutes) with a screwdriver and two screws – thanks Adrian! We had the use of half the refrigerated cabinet behind us, shared with Fowlers, so we crammed the pre-packs that we spent days preparing into that. I think it took us no more than three hours to set up. We were really pleased with the result. That was Monday. Tuesday was Trade Day with no selling, but a great arena to meet people: customers we know already, some customers whom we have never met, a couple of new potential customers and our fellow exhibitors. We don’t get out much, so it was interesting to see that there is quite a community and strong friendships amongst the exhibitors, all of whom seemed to know each other well. I would like to think that we made some new friends too. Wednesday was not so enjoyable: it was the public day. More of that later. Our thanks to Adrian and Adrian at the next door stand, Fowlers, who entertained us throughout the two days. And even bigger thanks to Bradburys who invited us to the show.